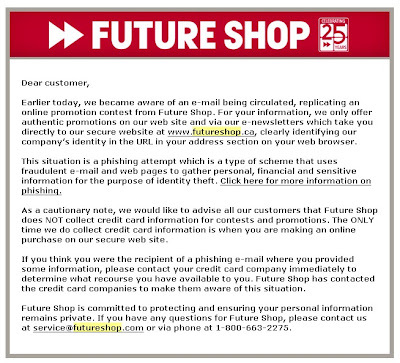 Yesterday the Futureshop sent this notice to their email subscribers. This is a grate example of building a relationship with relevant and punctual information to help protect and build trust with your organization. I would only recomend the following to complete the loop; 1 – add a notice on your home page about these kinds of fraud attempts, 2 – ensure this notice is linked to on the checkout, shopping chart and privacy pages of the website (basically anywhere you ask for sensitive information).